The Asphalt Institute Health, Safety and Environment committee hosted a fire prevention seminar during the organization’s summer meeting in Lake Tahoe, Nevada. The seminar was well attended with over 35 member companies being represented. The committee invited two guest speakers for the session, they included the National Fire Protection Association (NFPA) Principal Flammable Liquids Engineer Bob Benedetti and Marathon Petroleum Corporation’s (MPC) Health, Environment, Safety and Security Fire Protection Specialist Tom Lonyo. The seminar was split into two sections with Benedetti giving an overview of NFPA and discussing how their NFPA 30 document could apply to asphalt facilities. Lonyo’s segment covered Marathon’s fire prevention techniques and the community outreach program they developed to engage first responders in communities where they operate. So what does NFPA do? Founded in 1896, NFPA is a global, non-profit organization devoted to eliminating death, injury, property and economic loss due to fire, electrical and related hazards. The association delivers information and knowledge through more than 300 consensus codes and standards, research, training, education, outreach and advocacy; and by partnering with others who share an interest in furthering the NFPA mission. They are a leading advocate for fire prevention with over 65,000 members worldwide. During the seminar Benedetti gave an overview of NFPA’s standard development system for developing a new standard or for revising an existing one. Benedetti also noted that NFPA has two revision cycles each year and their documents are reviewed at least every 5 years. Topics covered in NFPA 30 address fire and explosion prevention and risk control, storage of liquids in containers, storage of liquids in tanks, piping systems, processing facilities, bulk loading and unloading and wharves. NFPA 385 covers the design and construction of tank trucks, tank trailers and tank semi-trailers used to transport stable flammable and combustible liquids, special requirements for tank vehicles used to transport asphalt, requirements for marking and for auxiliary equipment and specific requirements for delivery operators when loading or unloading the vehicle. Benedetti stressed that to determine each fire protection need, according to NFPA 30, facilities must answer a series of questions before coming to a conclusion. He stated that with a combination of fire protection professionals and NFPA 30 provided charts and forms, facility owners/operators can feel certain their buildings are code compliant. Lonyo concluded his segment of the presentation by saying “the time to prepare – is before the emergency.” His presentation provided an informative overview of Marathon’s disaster and emergency preparedness as well as discussed the various reasons to develop emergency response plans which included, life safety, protection of the environment, protection of a company’s critical infrastructure, the capability to maintain business continuity and public relations. He mentioned that many companies who currently have plans do not actively exercise these with emergency responders. “Merely having a plan does not produce the needed response and mitigation to a disaster if the plan is not exercised on a regular basis,” said Lonyo. Marathon believes in creating relationships with local emergency responders, neighboring business and residents in an effort to be proactive in the event there is an emergency. He stated that “proactive companies conduct pre-incident response drills on a regular basis with their local, state and federal responders. The time to meet your first responders is not the day of the incident”. MPC’s fire protection program plays a key role in providing disaster and emergency preparedness for fires by utilizing the three Es – educate, empower and equip. Marathon provides formal training to each of their local fire departments every five years and hands-on training when requested. As a result, MPC is building confidence through education to support local fire departments, so they can mitigate a storage tank fire in their community should such an emergency arise. MPC encourages members to create pre-incident plans with local emergency responders for use during an emergency. Their efforts focus on strengthening personal relationships and partnerships to foster resources between private and public entities. 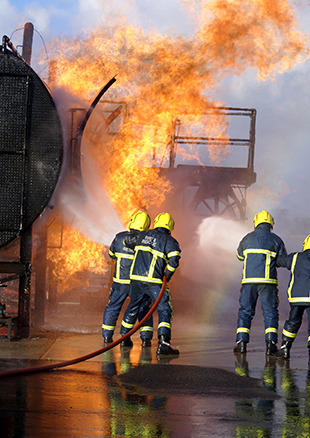 MPC has a supply network of firefighting foam and ensures that local fire departments are provided with proper equipment including nozzles, large flow fire trailers and foam trailers. In addition, they have created partnerships with water utility companies to share infrastructure that can benefit neighboring businesses as well as the entire community. Lastly, Lonyo noted that companies should also recognize and be ready to respond to the impact that social media will have during an incident. Social media and its use can make a good response look very bad if false information is disseminated. Lonyo encouraged attendees to be proactive, monitor social media and be ready to quickly respond to false information. Meeting and planning with first responders will establish relationships ahead of the incident and create an atmosphere of trust with your emergency responders and the public.